In San Francisco this week, over 300 women gathered for ENR’s 14th Annual Groundbreaking Women in Construction Conference (GWIC). Builders from all over the country came together to discuss, ask questions and promote change in a traditionally male-dominated industry that is only 9.3 percent women (Bureau of Labor Statistics). The issue of the dearth of women in construction–as well as many other STEM fields–is complex, nuanced, and there is not one simple answer. A confluence of factors ranging from unconscious bias learned at an early age, to a lack of women in the STEM pipeline, to recruiting, retention and development of women in technical and leadership positions will not likely be solved by any one quick fix. 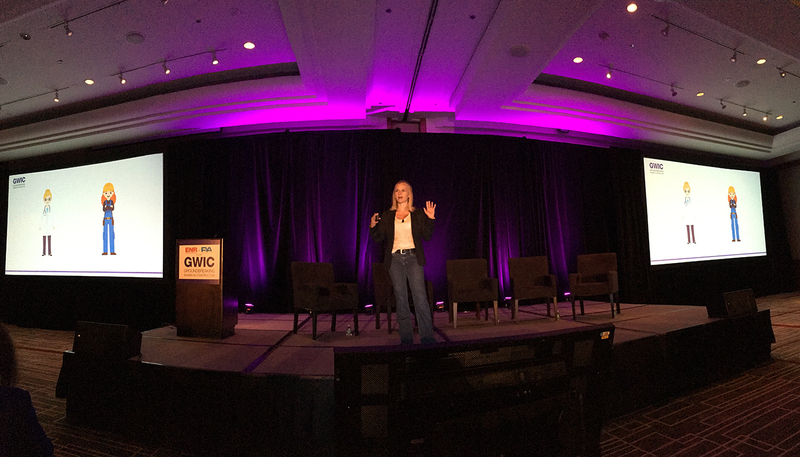 What GWIC provided was a much-needed starting point for a room full of builders–strong women who build great things each and every day. Industry speakers discussed the business case for diversity, ways to achieve buy-in from leadership, achieving parity in salaries and attracting the next generation of builders. DPR’s Gretchen Kinsella delivered an inspiring keynote address about her personal story and career journey. Gretchen is DPR’s youngest project executive in Phoenix, managing the largest project that we have ever built in the area—the $318-million renovation of Banner University Medical Center Phoenix (BUMCP). On the last day of 2016, she gave birth to her daughter in one of the very same rooms she built back in 2004. Gretchen’s story about how she found her voice and embraced who she is has resonated with readers across the country. The responses she has been getting since her story was published by ENR online in March and in the publication in April have been unexpected, inspiring and continuous. She receives emails every day from people who are still reading her story, people who identify with her challenges and victories and who are thankful to find someone who shares the same experiences that they do. The attendees at the conference experienced what others in the industry may feel every day–a sense of belonging with your peer group, a feeling of being accepted for everything you are and are not, and a refreshing knowledge that there are so many other builders out there like you, committed to creating a strong, supportive environment where everyone can thrive.